Packed with beautiful beaches, a robust arts and culture scene, and a bustling nightlife, it’s easy to see why Los Cabos is one of Mexico’s top tourist destinations. Cabo San Lucas and San Jose del Cabo, two cities at the tip of the Baja Peninsula, make up Los Cabos. Between the cities’ natural beauty and myriad activities, it’s a perfect destination for memorable incentive trips and meetings. Land’s End is the stretch of beaches where the Sea of Cortez meets the Pacific Ocean. Admire El Arco de Cabo San Lucas—the area’s most famous landmark—or take a glass-bottom boat to The Window to the Pacific. Or explore the two connected beaches: Play del Amor (Lover’s Beach), on the calmer bay side, and Playa del Divorcio (Divorce Beach) on the turbulent Pacific side. The Gallery District is the center of the region’s art scene, loaded with high-end art galleries that feature original paintings, sculptures, photography, jewelry, and more by artists from around the globe. Be sure to check out the San Jose Del Cabo Art Walk on Thursday evenings that runs from November to June each year. Los Tamarindos, just outside of San Jose Del Cabo, is the ultimate farm-to-table experience for foodies! The restaurant sits on a 19th century farm originally used to grow sugar cane, one of Mexico’s largest exports at the time. The real gem at Los Tamarindos is the hands-on cooking classes where you participate in the harvest, learn about the ingredients and history of the farm, and then prepare a delicious four-course meal. Another foodie destination is Cocina de Autor, which offers a 10-course tasting menu created by Michelin-star chef Sidney Schutte. Make your reservations early and come hungry! Whale watching in Los Cabos is a truly unique adventure! The waters around Los Cabos are home to nine species of whales, and is one of the most active breeding grounds for gray whales in the world. Though whales are spotted all year round, prime viewing season is January through March. No trip to Mexico is complete without a little bit of tequila! Even outside of Mexico’s tequila-producing region, the draw and culture around the liquor can be found throughout the country. Try out Slim’s Elbow Room—the hole-in-the-wall bar claims to be “the world’s smallest bar,” allowing just four visitors at a time to sip and sample. If you happen to visit in October, Los Cabos hosts an annual Baja Sur Tequila and Mariachi Festival where you can learn about the history and how it’s made, and, of course, taste. 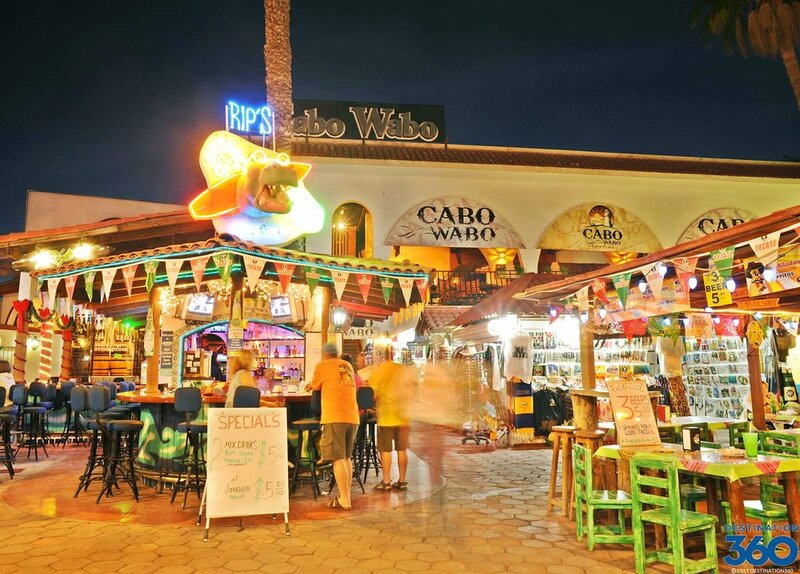 Cabo San Lucas is known worldwide for its active nightlife scene with iconic bars and clubs like Cabo Wabo, founded by Van Halen’s Sammy Hagar, and El Squid Roe. Want to learn more? Let SHW craft an inspiring and unique incentive trip for your group. Drop us a line at info@shworldwide.com, or through our online RFP tool.